The Finale to The Adventures of Christopher Marlowe! The final instalment in Darren Freebury-Jones’ The Adventures of Christopher Marlowe trilogy is now available on Amazon Kindle here. The Engines of War have a new leader in Richard Bancroft, who sends a team of bloody assassins to Turkey in search of the Quill of Herodotus, an ancient artefact with the power to transcend time itself. Marlowe finds himself on the most violent, action-packed mission of his career. But in this instalment, will The Engines of War prove fatal for him? Writing The Adventures of Christopher Marlowe trilogy was something of a literary experiment. In my academic work at Cardiff University, I employ plagiarism software to detect collocations shared between Shakespeare and his contemporaries, such as Peele, Kyd and, indeed, my dashing protagonist, Marlowe. My examinations of such phrases used by Elizabethan dramatists enable me to form theories concerning collaboration, authorial imitation and authorship. I have always been fascinated by collaboration, and the ways in which authors, according to accommodation theory, consciously or unconsciously echo each other’s portions. I asked a fellow indie author, Robert NC Thomas, to collaborate with me on the first book in the series, Kit Marlowe and the Demon Legion, because he was far more experienced in the action/adventure genre than I was, and I have long been an admirer of his writing style. We have collaborated on many projects together, including a radio parody of Arthur Conan Doyle’s Sherlock Holmes stories, and a screwball noir comedy for Edinburgh Festival Fringe, Satan Met a Shamus. We therefore have intimate knowledge of each other’s strengths and weaknesses as writers. Using plagiarism software and our respective portions for the first book (as well as his book Rupert Pinter and the Curse of the Tuatha De Danann, and my own first venture into fiction, Cinnamon Twigs: The Life and Pseudocide of a Celebrity), I was able to detect idiolectic formations that distinguished our authorial styles. This enabled me to consciously imitate his style in an attempt to unify the book, although inevitable difficulties arose in characterisation and plot consistency at times. We had met up to plot the story in our favourite pub, The Woodville, and decided that we would assign respective chapters between us, and I would subsequently edit them. There is only one chapter in Kit Marlowe and the Demon Legion that melds our individual passages, but it is far too much to hope that one day attribution scholars will attempt to distinguish our hands! This process of collaboration gave me insights into the ways Elizabethan co-authors might have worked. In the knowledge of my collaborator’s phrasal repetends, I was able to maintain the authorial voice of the first book when I came to write its prequel/sequel, Kit Marlowe and the Doomsday Fleet, solo. By time I came to the third book in the trilogy, Kit Marlowe and the Fatal Engines of War (forthcoming), I was able to unconsciously assimilate many of Robert NC Thomas’s phrasal structures into my own work. Furthermore, I strove to link the language of the books to the works of Shakespeare, Marlowe and company, so that you could say the whole trilogy is permeated by a plethora of authorial voices. I hope fans of Marlowe and Shakespeare will enjoy the reading experience; there are plenty of knowing winks throughout these stories. I am very grateful to Robert NC Thomas for his help on the first book, and to Charlotte ‘Meg’ Smith for her lovely artwork. Academia aside, the books, though extremely violent and dark in parts (much like Elizabethan and Jacobean dramas), are good fun and are interlaced with comedy. A lot of research has gone into developing the characters, based on historical material concerning figures such as Marlowe, Kyd, John Whitgift and Francis Walsingham. I have taken liberties at times for the sake of adventure and readership, and Marlowe’s musings on his fellow lodger’s dramatic corpus are somewhat subjective and based on my support for Brian Vickers’ work on Thomas Kyd’s extended canon. I would be incredibly grateful if readers of Cardiff Shakespeare could download these books, available on Amazon Kindle for just 77p each, and hopefully enjoy these short, easy (and admittedly rather silly!) reads. 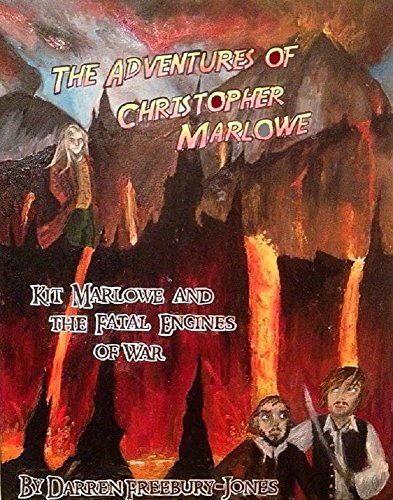 Christopher ‘Kit’ Marlowe, poet and spy, is sent to investigate the villainous Barnaby Ithamore, who intends to raise an army of demons from hell in order to destroy the world. In this pulse-pounding action/adventure story, the swashbuckling hero, armed with his trusty rapier, undergoes a breathless voyage across Elizabethan England, Spain, Italy and Germania, concluding in an explosive climax off the coast of Portugal… James Bond’s world of espionage meets the dark age of William Shakespeare in this unforgettable first book in The Adventures of Christopher Marlowe series. 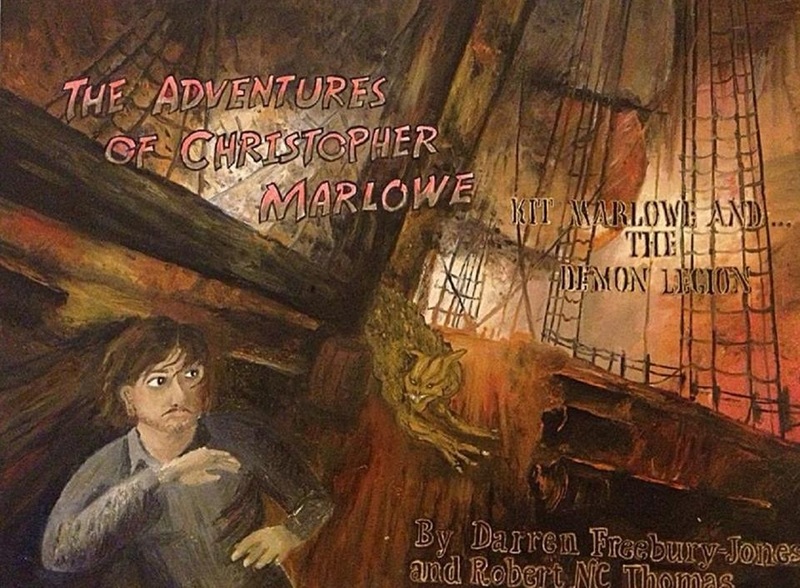 The Adventures of Christopher Marlowe continue in this thrilling prequel/sequel to Kit Marlowe and the Demon Legion! It is the eve of the Spanish Armada, and Marlowe is eager to join his comrades at Plymouth and wage war against Catholic Spain. However, his boss, the spymaster Francis Walsingham, has other plans, and sends him on a mundane mission to Linlithgow, in Scotland, to judge where the Scottish King stands on Protestantism… Marlowe soon finds that danger is never far away though, and, in the company of the beautiful heroine Chyna Dahl, pits himself against three deadly witches and an army of the dead. His mission leads him to the White Cliffs of Dover, and to an unexpected, devastating showdown… Hilarious, yet dark and extremely violent, Kit Marlowe and the Doomsday Fleet is an adventure like no other. Cardiff Shakespeare has a new twitter account – at the same handle @CardiffShakes. Please re-follow! I have, during the course of writing my thesis at Cardiff University, been immersed in Shakespeare’s early plays, such as the Henry VI trilogy, and have analysed his style in the context of imitation and collaboration. It was therefore refreshing to see a production of a play in which Shakespeare refined the history genre and found his own distinct authorial voice, while surpassing the dramatic language of his contemporaries, such as Christopher Marlowe, George Peele and Thomas Kyd. I had no misgivings about the fact that the University of South Wales decided to conflate the first and second parts of Henry IV, for the first part would feel lost without its sequel, and the Dering manuscript, prepared around 1613, suggests that this was sometimes the case even in Shakespeare’s day. I was uneasy about the notion of modernising aspects of the play, given its emphasis on a span of history circa 1403, but more on that later… I do struggle with gender swapping in casting (a staple in student productions, it seems), unless it serves a dramatic or didactic purpose – with Henry Bolingbroke himself played by a woman here – but then I suppose this is a mere subversion of the all-male casting of Shakespeare’s theatre. 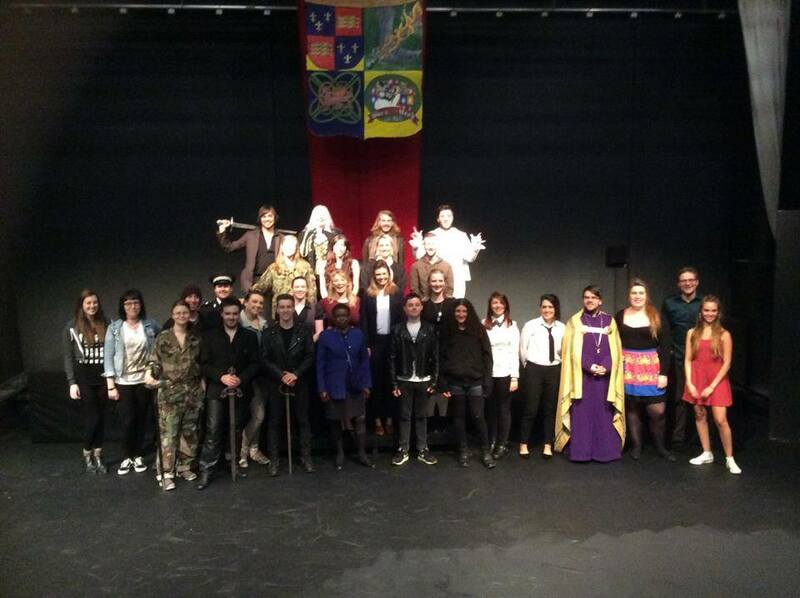 The cast, for the most part, did well in making Shakespeare’s sometimes knotted language accessible to the audience. Having worked with Scott Patrick before, I was delighted to discover that he was playing Falstaff, Shakespeare’s most revered comic creation perhaps, next to Bottom. The man’s side-splitting improvisations made me break character once in a production of One Flew over the Cuckoo’s Nest, so I expected big things, and (it’s safe to say) he certainly delivered. In fact, his presence often dominated the stage like a colossus, and this huge bombard of comic brilliance was complemented by evident understanding of the significance of certain speeches (and great subtlety), such as Falstaff’s catechism on the concept of honour. Simon King gave a very assured performance as the ruggedly handsome future king, and I must mention Poppy Sturgess as Mistress Quickly. She evinced great comic timing throughout her scenes and had a real natural flair for stage humour. The second half, being more sombre, did not quite have the same impact as the first (a consensus long shared among literary critics regarding the second part of Henry IV), and this might have had something to do with the maladroitness of stage combat. Though Thomas Nashe praised the staging of ‘all stratagems of war’, Shakespeare’s fellow playwright Ben Jonson mocked actors who ‘with three rusty swords, And help of some few foot-and-half-foot words, Fight over York, and Lancaster’s long jars’. Still, the second half brought to fruition the banishment of Falstaff and the crowning of Harry, in an ambiguous resolution, which transcended jingoistic interpretations of Henry V. The audience left smiling, and I hope that the actors and crew enjoyed a great deal of sack in deserved celebration. As Shakespeare might say, they’re likely to have woken up in their drowsy beds recalling ‘a mass of things, but nothing distinctly’. The audience, and myself, won’t forget the details of this enchanting production anytime soon. See the production flyer here. Kit Marlowe and the Demon Legion. Download the kindle edition from amazon here.